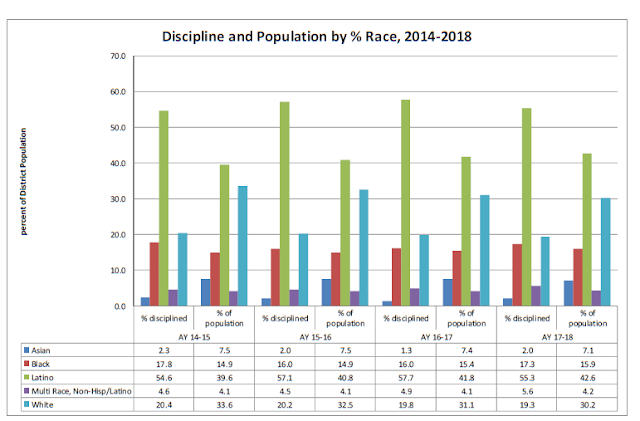 ...as you can clearly see that the percentage of students being disciplined who are Latino or Black is out of proportion with their enrollment in the district. It's worth noting that this was raised during the last election and again came up in relation to Worcester's use of emergency removals during this past fall. It also struck me this morning how parallel this is to an exchange that Rep. Katherine Clark had with Secretary DeVos this past week in if you see systems or students as the work to be done. What is posted on who-cester is my work and my views; what is posted here does not represent the views of the Massachusetts Association of School Committees (for whom I work as a field director). You'll need to look at masc.org for that. Worcester election season round # ? The Constitution of the Commonwealth of Massachusetts, Chapter V, Section II. Wisdom, and knowledge, as well as virtue, diffused generally among the body of the people, being necessary for the preservation of their rights and liberties; and as these depend on spreading the opportunities and advantages of education in the various parts of the country, and among the different orders of the people, it shall be the duty of legislatures and magistrates, in all future periods of this commonwealth, to cherish the interests of literature and the sciences, and all seminaries of them; especially the university at Cambridge, public schools and grammar schools in the towns; to encourage private societies and public institutions, rewards and immunities, for the promotion of agriculture, arts, sciences, commerce, trades, manufactures, and a natural history of the country; to countenance and inculcate the principles of humanity and general benevolence, public and private charity, industry and frugality, honesty and punctuality in their dealings; sincerity, good humor, and all social affections, and generous sentiments among the people.